With Australia’s clean energy investment at an all time high and solar costs continuing to fall, is now a good time to get solar for your roof? Here’s a guest post from PowerScout to help you assess your options. Most solar sales pitches extol the virtues of solar power and promise thousands of dollars in savings. While more than 1.6 homes and businesses in Australia have already adopted solar power and are enjoying the benefits, the viability of rooftop solar depends largely on the conditions of your home and your local energy market. In fact, solar power economics can vary from house to house even within the same neighborhood. Before investing in solar energy, it’s important to ensure that solar panels are worth it for you. What determines whether it’s worth it? Here are a number of areas to consider. The higher your current electricity prices, the more likely you will save money by installing solar panels. To figure out how much you’re paying, just check your electricity bill. The bill should indicate how much you’re paying per kilowatt-hour. Electricity rates vary substantially based on where you live, so don’t assume that your rate is the same as the national (or even state) average. The average cost of energy produced by solar adjusted over the average lifetime of the panels is around $0.22 per kilowatt-hour. If you’re currently paying more than that for electricity, you likely stand to save significant money by installing solar panels. It’s one of the reasons why South Australia－where early last year, wholesale electricity costs rose to $115.93 per megawatt-hour, the highest rate in the nation－has been one of the leading adopters of renewable energy (pdf). Electricity prices across Australia have grown by 183 percent over the past two decades. In some markets, the price increases are even steeper. In an environment of rising electricity costs, one of the big advantages of installing solar panels is that you can effectively lock in your electricity rate for the next 20 to 25 years (the operational lifetime of most solar panels). Even if you’re just leasing your solar panels, you’ll still be paying a flat monthly rate based on what the system is expected to produce. And if you obtain a solar system through a power purchase agreement (PPA), your electricity bill will vary based on how much energy you use, but the rate used to calculate your bill will remain constant over the course of the agreement, protecting you from surprise rate hikes. The better the deal you’re able to get on your solar system, the more you’ll save by switching to solar power. Solar panels were so expensive when they first started being used in the 1960’s that they were only used in advanced space and military applications (pdf). But by the early 2000’s, prices had fallen to the point that average homeowners could adopt solar, and with recent advances in technology and scale, solar panel prices have continued to plummet. According to the International Renewable Energy Agency (IRENA), solar panel prices dropped 80 per cent between 2008 and 2014. IRENA analysts predict that by 2025, the cost of solar modules will be 59 percent cheaper than it was in 2016. Despite future cost reductions, it’s still more cost-effective to switch to solar right away; adopting solar later means you’ll lose out on the opportunity to save money now. Identical solar panels produce different amounts of electricity depending on upon how much sunshine they receive. Queensland and New South Wales receive less direct sunlight than Western Australia, so solar panels installed on the west coast will produce more electricity than solar panels elsewhere. Most homeowners can meet 50 to 80 per cent of their energy needs using a modest three or four-kilowatt solar system. Even if your home is in a state that gets plenty of sunshine, not all parts of your roof are right for solar. In Australia, north-facing roofs typically get the most sun. East and west-facing roofs are also good for producing electricity. 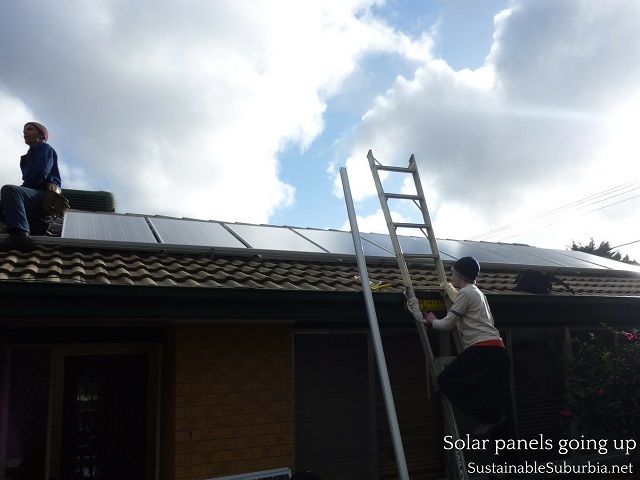 South-facing roofs are not ideal for solar in Australia and should be avoided in most cases. In addition, it is important to minimize shading from nearby trees, buildings and other obstructions on the roof, including chimneys, vents, and so on. If your roof is lightly or even moderately shaded, solar panels may still be viable. Systems with advanced technology such as microinverters and DC optimizers can mitigate the effect of shading (pdf). But the best way to maximize your system’s output is to simply be smart about where you place your panels. Avoid heavily shaded roofs unless you are able to address the source of shading (by trimming tree branches, for instance). The more incentives and rebates you qualify for, the more economic sense solar power makes. The federal government, along with most state and even many local governments promote clean, sustainable communities by subsidizing solar panels. The federal government, for instance, offers Small Technology Certificates (STCs), which function essentially as a government rebate on the cost of your solar system. You’ll receive one STC for every megawatt-hour of energy your system is expected to produce until 2031. The STCs are exchanged at a variable rate that hovers around $38 each. So if your system is expected to produce 100 megawatt-hours by 2031, for instance, you’ll receive $3,800 after purchasing and installing it. Australian homes use a lot of energy. Lighting, appliances, refrigeration, and other household electrical use comprises about one-third of the average family’s total energy use. These home energy expenditures add up to about 18 tons of greenhouse gases per year. Depending on the scale of your solar system, solar panels can significantly or completely reduce your home’s carbon footprint. Moving away from fossil fuels can also improve public health, saving businesses and citizens money. Three-fourths of renters said they would be willing to pay extra to live in a property with solar power, and 85 percent of Australians believe that solar power systems add value to their property. One estimate suggests that for each kilowatt of solar panels you add to your home, its value rises by $6,000. For instance, if you add four kilowatts of solar panels to your roof, your home would increase in value by about $24,000. Adding a battery to your home solar system can save you money if you don’t feed excess energy back into the grid (a process known as net metering). On the other hand, if your home is connected to the grid and you have a net metering arrangement, you’re often better off allowing your excess energy to flow back to the grid, since feed-in-tariff compensation rates (the money you earn through net metering) can be higher than the retail price of energy. Kyle Pennell is the Content Manager at PowerScout — we help homeowners figure out if installing solar is right for them and get competitive bids from multiple installers. Our long-term mission is to accelerate the adoption of solar (and other smart home improvements), which will help mitigate climate change. I’m considering adding solar panels to my roof, though the biggest barrier is still the cost. Between purchasing the panels to installation, I’m looking at a rather hefty investment that based on my calculation will take years to pay back. Yes, that is probably true John, depending how large your system is. It will pay for itself, but it does take time. So from an economic view point, part of the question is, do you have to borrow money to do it, and if so, will the savings/income from the panels payoff both interest and principle? We use solar panels for our office. The comparison of bills before and after we use it is unbelievable! Anyways, it is great to invest in solar panels. Must try. Thank you Kristen for a post. Recently solar panel prices have been dropping in MD (where I live) and have become a good investment to power single family homes or small office spaces. Go solar!